This walking tour will take you to some of the best spots in Downtown Denver, where the city’s past and present come together in utterly unique ways. Many of the sites and buildings are listed as official Denver landmarks or included in the National Register of Historic Places. Many also have markers and plaques noting their original intended purpose and construction dates. Use the 16th Street Mall as your home base. Designed in 1982 by I.M. Pei, the 16th Street Mall is a mile-long pedestrian promenade lined with outdoor cafés, flower baskets and retail shops, making it the perfect starting point for an adventure-filled day. Free shuttles travel both directions the entire length of the Mall from early morning to late at night. They stop at every intersection, making it easy to cover a lot of ground in a short period of time. So, grab a cup of coffee and let the day begin! This area comprises a 25-block area that just a decade ago wasn’t much more than abandoned warehouses and rail yards. Today, it has been restored and renovated to create LoDo (Lower Downtown), one of the liveliest areas in the city — not to mention one of the most historic. Start your tour of the area at the newly renovated Union Station. At its height, 70 trains a day passed through Denver. Not quite as many trains pass through Union Station these days, but the beautiful building (originally constructed in 1881) still attracts visitors with its Beaux-Arts-style design, expansive interior, stone clock tower and uber-popular shops, restaurants, bars and cocktail lounges. Cross Wynkoop Street and learn about the early history of the area from historic markers that can be found on buildings at 1801 Wynkoop St. (Littleton Creamery / Beatrice Foods Cold Storage Warehouse) and 1635 17th St. (Denver City Cable Railway Building). Keep walking down Wynkoop towards Coors Field, the home of the Colorado Rockies, Denver&apos;s hometown Major League Baseball team, established in 1993. Constructed in the mid-90s, the ballpark has earned a reputation as one of the best in the country, combining state-of-the-art technology with a nostalgic ambiance. It was modeled after the Camden Yards Ballpark in Baltimore, and its red-brick construction matches the red-brick architecture of much of LoDo. Don’t miss the baseball art displays as you enter from Wynkoop. Your next LoDo stop is the classic Oxford Hotel, the oldest still-standing hotel in Denver, constructed in 1891. You’ll find a historic marker on the outside that will give you the lowdown on this LoDo gem. Inside, take a look (and grab a cocktail) at the Cruise Room, an Art-Deco bar that was designed after a lounge on the Queen Mary cruise ship. Just across the street from the Oxford on Wazee is the famed Rockmount Ranch Wear. A Denver original, fashion pioneer Papa Jack Weil invented the Western snap-button shirt and opened shop back in 1946. Jack passed away at the grand old age of 107 in 2008, but not before he sold his shirts to presidents and rock stars alike, including Eric Clapton and Bruce Springsteen. Stop by the flagship store, now run by Papa Jack&apos;s grandson, to browse the incredible selection of Western-style shirts, hats and accessories. More Denver history can be found in Larimer Square. It was here that the city got its name, when, in the 1850s, representatives from various settlements in the area got together over a barrel of whiskey and decided to consolidate their resources under one name. Denver was originally named after James Denver, the Kansas Territorial Governor at the time, following the merging of the settlements of Denver City and Auraria. Today, Larimer Square is one of the most stylish spots in the city, with high-end fashion boutiques, chef-owned restaurants and cafés and much more. Note: If you continue walking north on 15th St., you can get to such popular attractions as the Downtown Aqaurium and the Children’s Museum of Denver and up-and-coming neighborhoods like Highlands. On the corner of 16th and Wynkoop, you’ll encounter one of Denver’s most treasured attractions — the independently owned and operated Tattered Cover Book Store. Of course, calling Tattered Cover merely a “book store” is doing it some injustice. Its multileveled location is filled wall to wall with books, magazines, greeting cards, gifts and souvenirs. There’s also a great café serving coffee, pastries and sandwiches. This is an ideal spot to take a break and settle in with a good book — browsing is strongly encouraged! Also enjoy the architecture; this building once housed the Morey Mercantile warehouse business, which thrived in the late 19th century. Much of what you’ll find in LoDo still retains its historic feel, but that doesn’t mean there isn’t room for modern architectural wonders, too. Case in point: Museum of Contemporary Art Denver, at 15th and Delgany, designed by cutting-edge London architect David Adjaye. Its sleek interior houses works by some of today’s most innovative artists, and the rooftop café offers a stunning view of Downtown. Connecting Riverfront Park and the 16th Street Mall is the Millennium Bridge, constructed in 2002. This unique tubular steel footbridge was designed to resemble the mast of a great ship, stretching an impressive 200 feet into the sky. Either climb the stairs or take the glass elevator to the top. From there, you’ll be treated to a great view of Downtown, as well as the Platte River. On the other side of the bridge, Riverfront Park is a wonderful spot to relax and enjoy the gently rolling Platte River. Okay, you’ve explored LoDo — time to head to the center of Downtown. Either walk up 16th Street or hop on the free 16th Street Mall Shuttle. The Theatre District is a few blocks west on 14th Street, highlighted by the incredible Denver Performing Arts Complex. Hear those bells tolling? That’s the D&F Tower (Daniels & Fisher), one of 16th Street’s most distinctive buildings. When it was completed in 1910, this was the highest building west of the Mississippi River. It is modeled after The Campanile (St. Mark’s Bell Tower) in the Piazza San Marco in Venice, and its four clocks (one for each side) are a whopping 16-feet high. So, if you’re caught without a watch, just look up. The Tower was built to house one of Denver&apos;s largest early 19th century department stores. Today, the basement of the D&F Tower has been renovated into Lannie’s Clocktower Cabaret, an entertainment venue. Ground zero for the Denver performing arts world is, naturally, the Denver Performing Arts Complex (DPAC). Located in the heart of Downtown at 14th and Curtis Streets, the DPAC houses the 2,700-seat Boettcher Concert Hall (the nation’s first in-the-round concert hall), the Helen Bonfils Theatre Complex (with four separate stages), the 2,830-seat Temple Hoyne Buell Theatre, the Donald R. Seawell Grand Ballroom and the Ellie Caulkins Opera House. The Denver Center Theatre Company makes its home here and since 1979 has created an impressive body of classic and contemporary drama and world premieres. In addition to the excellent performances happening indoors, Downtown Denver is also filled with fun public art — pretty much everywhere you look you’ll see something. Over at the Denver Performing Arts Complex, get an eyeful of the fifty-foot-tall “Dancers.” Around the corner at the Colorado Convention Center is “I See What You Mean,” a.k.a. the Blue Bear. Designed by Denver-based artist Lawrence Argent, this curious, 40-foot-tall bear has rapidly become a Denver icon and is a great spot for a family photo. The public art in Denver isn’t all visual either. Stroll down the 1500 block of Curtis Street and you’ll hear Jim Green’s “Soundwalk” — there are speakers under six ordinary-looking grates connected to a tape recorder in a nearby building, playing 40 to 100 selections per hour, including rumbling, gurgling water and other whimsical sounds. The Equitable Building, built in 1892 at the corner of 17th and Stout Streets, was designed in the lavish Italian Renaissance Revival style and features some stunning stained-glass windows inside. Look for the historic marker on the exterior to learn more about this Downtown landmark, once the tallest building in the city before it was surpassed by the D&F Tower. The Paramount Theatre is one of many historic theaters in Denver. Built in 1930, the Paramount was originally a classic Art Deco movie house; today, it hosts an amazing array of live music and performing arts. Look for the historic marker on the exterior to learn more. Designed in 1887 by Robert Roeschlaub, Colorado’s first licensed architect, the Trinity United Methodist Church is a splendid example of the Gothic Revival style. The church was constructed entirely out of rhyolite from Castle Rock, Colo., and it features a stained-glass window by the Tiffany Company. Head inside to gawk at the gargantuan Roosevelt Pipe Organ — with its network of thousands upon thousand of pipes, it can make quite a sound. At the end of the 16th Street Mall, you’ll come upon the Golden Triangle Creative District, one of Denver’s cultural hubs, with museums (naturally), restaurants and shopping options galore. The neighborhood is also home to several wonderful art galleries, all worth a visit. The splendid Civic Center Park resulted from the inspiration fostered by the "City Beautiful Movement" following the World&apos;s Columbian Exposition in Chicago in 1893. Elements of well-designed and beautiful parkways, fountains and tree landscaping were merged together in this space and in many other U.S. city park beautification programs. The City and County Building, completed in 1932, anchors the west end of this park. During the summer months, Civic Center Park hosts multiple fun festivals. From Civic Center Park you can look over many of Downtown’s architectural gems, including the Denver Public Library, designed by Michael Graves, and the original 28-sided Denver Art Museum, designed by Gio Ponti. Nearby, you’ll find the Center for Colorado Women’s History at Byers-Evans House Museum, which was built in 1883 and is now a museum, and the U.S. Mint, modeled after the Plazzo Medici-Riccardi in Florence, which was built in 1904. Civic Center Park is also full of public art, from Old West-inspired pieces to modern wonders. Modeled after the U.S. Capitol in Washington, D.C., the 272-foot-high dome of Colorado’s State Capitol is covered with 200 ounces of 24kt. gold leaf. However, the truly priceless material is inside, where the entire world’s supply of Colorado Rose Onyx was used as wainscoting. No more of the ultra-rare, rose-colored stone has been found since. Construction on the building began in 1886 and was finally completed in 1908. Free tours of the Capitol offer this and other tidbits of information, as well as visits to the Senate and House of Representatives chambers. One of the city’s newer architectural jewels, the Denver Art Museum&apos;s striking Frederic C. Hamilton Building opened to rave reviews in October 2006. Its bold, jagged look was inspired by the Rocky Mountains and by the geometric rock crystals found in the foothills near Denver. Of course, the original building — built in 1971 and designed by Italian architect Gio Ponti — remains an indelible part of the Denver landscape and is renowned for its collection of Native American art and artifacts. The art inside DAM is impressive, but the buildings themselves are attractions all on their own. 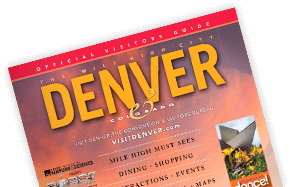 Hit Denver's highlights in 3 days with helpful tips for exploring downtown, discovering nearby attractions and heading to the mountains. Denver is the perfect spot for an affordable vacation getaway. These free tours take you behind the scenes at several unique attractions. Denver's rich history artfully blends with more modern architectural wonders. Use 16th Street Mall as the launching point on this self-guided walking tour.